Such was the interest in the Cayman Islands presentation we ended up having to do it twice in succesive one and half hour 'back to back' sessions. The feedback has been tremendous from countries all around the world! An essential part of the Hon. Ministers presentation to the Ministerial Seminar on Technology in Education was to really stress how much consultation we have done with all stakeholders, including, most importantly students. 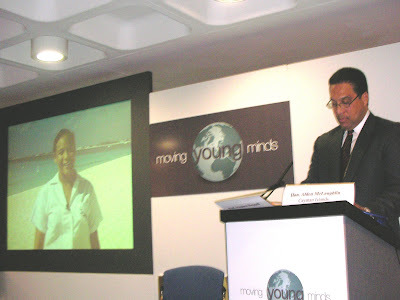 We consider this so important that our brochure not only has a photograph of a student with a quote, but the Ministers presentation ended with a short piece of video of the student talking for herself aout her hopes for the new schols heling her being recognised not just in the Cayman Islands but around the world. As I sat and listened to contributions from Education Ministers from all round the world over the two days, I noticed that no one else quoted a student and few even referred to them except to give national statistics of numbers. If people are really talking about students being at the centre of everything they do - why don't they ask them more? They do have a great deal to offer!